Link-Belt Construction Equipment is showing its seriousness about growing its share of the market for telescopic crawlers. The company will get a lot of attention with its latest offering in the tele crawler line, the all-new 50 US ton (45 metric ton) capacity TCC-500, which has already been built and tested at the Lexington plant and will be shown at ConExpo in Las Vegas in March. It is the third crane in Link-Belt’s tele crawler line and it’s a solid piece of equipment that will engage companies in the power utility industry, especially, the manufacturer said. Link-Belt is telling its distributors about the new crane. Shipping to customers is expected to start by early March. And the bells and whistles are aplenty, from audible and visual alert systems to rear and winch view camera systems. The TCC-500 offers an impressive capacity chart that rivals lattice crawler cranes with a similar base rating. The four-section, full-power boom on the TCC-500 is 35 feet, 6 inches to 110 feet in length with box-type construction of high tensile steel consisting of one base section and three telescoping sections. The vertical side plates of the boom have diamond-shaped steel impressions for a higher strength to weight ratio. Fly jib options include a 28.5 to 51 feet (8.7 to 15.5 meter), two piece bi-fold lattice fly, stowable, offsettable to 2, 20 and 40 degrees; maximum tip height is 165.5 feet (50 meters). Link-Belt has designed the TCC-500 to move quickly and easily on or off the jobsite. With a standard counterweight package of 25,000 pounds (11 metric tons), the TCC-500 transports in just one load while staying under 100,000 pounds (45 metric tons) in most cases. On the trailer, the TCC-500 travels at a height of 9 feet, 10.55 inches (3 meters) and a width of 11 feet, 5.24 inches (3.5 meters). For flexibility on the jobsite, a hydraulic cylinder mounted in the lower frame hydraulically extends and retracts the all-welded, machined steel track frames. The TCC-500 can work at three track widths: 15 feet, 2.37 inches (4.6 meters) fully extended; 13 feet, 6.11 inches (4.1 meters) intermediate; and 11 feet, 5.24 inches (3.5 meters) retracted. It has two travel speeds and can travel up to 2 miles per hour (3.2 km/h) to spend less time traveling and more time lifting. A Tier IV final Cummins QSL engine powers the TCC-500, producing 215 hp and driving a variable displacement piston pump package. Simple and dependable hydraulic pilot-operated control valves distribute flow to all functions, the company said. Other features include available boom-mounted 360 degree floodlight, swing audible and visual alert alarm with swing stop system, wind speed indicator, drum rotational and directional indicators and upper guard rails. It also has pole claw, earth auger and man basket attachments. “The TCC-500 is an excellent general contractor crane, and its moneymaking potential is huge,” Collins said. 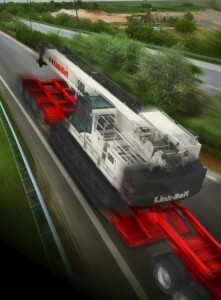 Link-Belt has also developed an export version of the crane with a Tier II Cummins engine. “We feel really good about this crane, and we are excited to show it off at ConExpo,” Collins said. Oh my goodness! Incredible article dude! Thank you so much, However I am encountering difficulties with your RSS. I don’t know why I cannot join it. Is there anybody else having the same RSS problems? Anyone that knows the solution can you kindly respond? Thanx!! Thanks for your feedback.. I am working on a page which answers the question: “how do cranes work?’. I am telling you because you might be interested. About the RSS feed, have you tried http://cranesblog.com/feed ? Could you elaborate on this? I just want to mention I am just very new to weblog and definitely liked your web site. Probably I’m planning to bookmark your blog . You amazingly come with good articles and reviews. Many thanks for sharing your website.